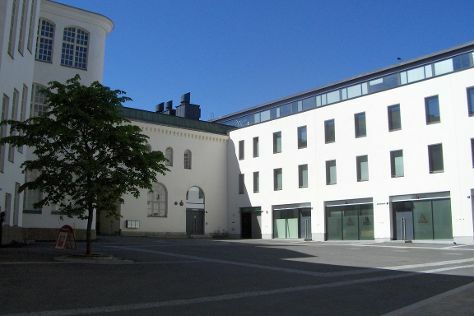 On the 9th (Sat), take in the architecture and atmosphere at Finlayson Church, see the interesting displays at The Finnish Labour Museum Werstas, then examine the collection at Tampere City Library, Metso, then take in the spiritual surroundings of Tampere Cathedral, and finally examine the collection at The Car Museum of Vehoniemi (Vehoniemen automuseo). On the 10th (Sun), you'll have a packed day of sightseeing: take in the architecture and atmosphere at Church of St. Alexander Nevsky and St. Nicholas, examine the collection at National Police Museum, then get a taste of the local shopping with Galleria Ronga, then shop like a local with Laukko Manor, and finally pause for some serene contemplation at St Olaf's Church in Tyrvaa. To see maps and other tourist information, you can read our Tampere online trip planner . If you are flying in from United Kingdom, the closest major airport is Tampere-Pirkkala Airport. In February, daytime highs in Tampere are -1°C, while nighttime lows are -7°C. Finish your sightseeing early on the 10th (Sun) to allow enough time to travel back home.